The Tyler Hitchcock Agency, a family managed insurance and financial planning firm with business and residential clients throughout the Dallas/Fort Worth metropolitan area, is initiating a charity drive in conjunction with the Grand Prairie Youth Football Association to benefit local teens. 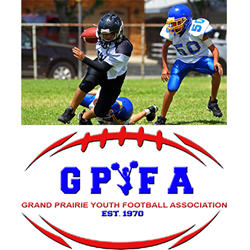 As part of this charity event, the Grand Prairie Youth Football Association will be raising funds to pay the registration fees of children from underprivileged families. A growing number of families the region face financial difficulties and this charity event intends to give children who might not normally be able to play football a chance to take the field. “Football is a way of life in Texas, and every child should have a fair chance to take their place on the gridiron alongside their friends, regardless of their background or their circumstances,” says Tyler Hitchcock, founder and manager of the Tyler Hitchcock Agency. The Hitchcock team is building bridges and gathering support with families and businesses throughout the region utilizing social media and an email update system. Also, a full page article featuring the Grand Prairie Youth Football Association charity event is scheduled for release in the next issue of “Our Hometown,” a monthly online magazine published by the Tyler Hitchcock Agency. Several other eastern Texas charities and nonprofit organizations have enjoyed the support of the Tyler Hitchcock Agency over recent months. As part of a community involvement initiative dubbed “Agents of Change,” the Tyler Hitchcock team will be working with a new Dallas area charity every 60 days. For those who want to join the Tyler Hitchcock Agency for the Grand Prairie Youth Football Association charity drive are invited to make a personal contribution to the cause from this page: http://www.tylerhitchcockagency.com/A-Football-Promise-to-Families-in-Need_14_community_cause. For those who wish to learn more about nonprofits supported by the Tyler Hitchcock Agency in the past, a full roster of previously assisted charities can be found here: http://www.tylerhitchcockagency.com/community-cause. A full service insurance provider serving families and businesses in Grand Prairie, TX, The Tyler Hitchcock Agency is committed to bringing local people an agency which understands their needs. Tyler and his team of dedicated professionals work with carriers to assemble a variety of products and services which will ensure their clients’ peace of mind. From all of the products a typical consumer needs (home, auto, boat, ATV, and more), to financial planning consultation, The Tyler Hitchcock Agency delivers consistently superior service. To contact an expert at the Tyler Hitchcock Agency, visit http://www.tylerhitchcockagency.com/ or call (972) 642-0798.